← 4 Presentation skills that will make your day if you’re not Clint Eastwood. It’s Halloween week. In Washington, DC and along the Eastern seaboard we’re all hunkering down and waiting for Sandy, Hurricane Sandy. This could put a serious crimp in my daughter’s costume plans. Getting dressed up is fine, but showing off your Princess-Spider-Ballerina costume in front of real people makes all of the difference. It’s the emotional sensation of a live audience that makes everything different. Live audiences energize performances. In a former life I was a stage performer at a Six Flags amusement park. I sang and danced as a part of a twelve member cast in a thirty minute production. After many months of practice and weeks of full-dress rehearsals, nothing beat the pulse of a live show. There was always something different, something better, when there were people in the theater. Receiving positive attention and hearty responses from the audience, the performers exuded greater energy. Lift your presentations. It’s is the same with public speaking and corporate presentations. You can practice for hours, as you should. You can do full dress and tech rehearsals, as you should. But, there will always be something different, better, when you actually present in front of an audience. They’ll give you a lift that can’t duplicated during your practice sessions with empty chairs. Dare to compare. Take a look at a Pecha Kucha* presentation (6 min 40 sec) on Houdini that I recently delivered to a conference room packed with people. Something truly magical was created by the audience’s interaction and responsiveness. Eight months earlier I did the very same Houdini Pecha Kucha presentation. On that occasion there was no audience, only an empty room. Can you sense the difference? Without side by side comparison you’d never know the difference of how good the presentation could be. In isolation both presentations are fine. However, seeing one than the other, one is clearly better. Never underestimate the power of an audience. Seek out an audience for your message. Your presentations, whether to groups of three or three hundred, will be affected by the presence of people. They’ll give you a lift that lets your presentation soar higher than during your practice runs. 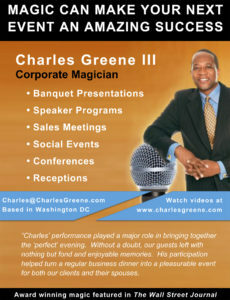 This entry was posted in Public speaking and presentation skills and tagged Audience, Houdini, Pecha Kucha, Preparation, presentation structure, Presentation Summit, public speaking, Scottsdale, Story structure, Three Magic Keys, Toastmasters. Bookmark the permalink.